Paula Deen | Have YOU Ben Starr Struck? I’m about fed up with our country’s obsession over words. Words have no power. PEOPLE give power to words. By focusing so much stigma on this “n-word” all we do is continue to give it supernatural evil powers. No word, in and of itself, has the power to do anything. When we make such a drastic scene out of someone using a word, all we do is perpetuate the perception of power that word has. Similarly…racist jokes. Some people get deeply, horrifically offended by them. Personally, I’m ALL FOR racist jokes, because they rob racism of its power. Same with sexist jokes. And homophobic jokes. When we can all laugh at an issue, instead of get bound up in angst and offense over them, we’re a step closer to that issue not existing any more. I might go so far as to say that the equality groups that work SO HARD toward equality are as guilty of perpetuating racism as pro-racist groups are. When we continue to view humans in categories…black…female….gay…Christian…Democrat, we promote continued division and inequality. These celebrations of “feminist pride” and “gay pride” and “black pride” simply keep us at arm’s length from each other. It’s only when we STOP identifying as a minority group and start identifying as part of a single human community that we will ever reach true equality for everyone. None of us know Paula Deen, so I’m not comfortable making a judgement call on her. (I wouldn’t be comfortable doing that ANYWAY…it’s not any human’s place to judge another, unless you’re forced into that job as an actual judge.) I do know people, black people among them, that have worked with her in a production capacity who say she’s delightful. And for those of us who’ve watched her for years, it’s hard to suddenly imagine her as the worst racist tyrant in the food industry. Paula is one of the few celebrity chefs reputed to be the exact same person on camera as she is off. The most racist thing I’m going to say in this blog is that many white people absolutely LOVE to be offended on behalf of minorities. It’s intoxicating for them. We have YET to see any African Americans make allegations against Paula…these allegations are brought by a Caucasian woman who is offended on behalf of Paula’s black employees. Of course, regardless of whether the allegations are true or not, this lady is going to claim “I’m speaking for those who are too scared to speak for themselves.” But all these -isms only become -isms when there’s a closed circle…racism cannot exist unless there are victims on the other end of the equation to take offense or be harmed. When my partner and I are holding hands in a park and some frat boys cat-call at us and hurl the “f-word” around…we don’t need to charge them with a hate crime, because frankly we don’t care about what they say. There’s no homophobia. Because we don’t complete the equation and allow ourselves to feel hurt or threatened by it. We laugh at them and shout, “You know, it boys! Wanna come over tonight?” And it becomes a joke, no one gets hurt or offended, and the frat boys realize they have lost their power and slink away. Another moment comes to mind from the time that all my fans were riled up about the semi-automatic weapons issue on my Facebook page during the holidays. I was crucified by one woman when I referred to her as “sweetheart.” She was supremely offended that I would be so sexist towards her. Where I come from, “sweetheart” is a term of affection that my mama taught me to use out of respect and love toward women. Yet this woman was deeply, supremely offended by it, and took the chance to forever label me a male chauvinist pig before she blocked me. The ONLY capacity in which I am sexist is my belief that women are superior to men in almost every aspect. She interpreted sexism where there was none. So there WAS none, because the equation wasn’t complete. Which brings me to the Trayvon Martin murder trial that’s happening right now, and how desperately I laughed at the Defense as he was questioning Trayvon’s best friend, Rachel Jeantel, who was on the phone with Trayvon until moments before he died. Trayvon had told Rachel that he was being followed in the pouring rain by a “creepy cracker.” The Defense was trying to spin this as a hate-filled racial slur that triggered George Zimmerman to defend himself in fear of his life. The Defense acted truly shocked when Rachel said that she didn’t consider the word “cracker” to be racist at all. (That’s simply what folks in her world call white people.) And as offended as the Defense may be by that, if it’s not delivered with hate, it’s not racist and it has no power…even if he receives it with fear and offense. Because the equation works both ways. The actual debate over this issue is so silly, it makes me laugh. Because it’s about different perceptions of a word: “marriage.” The Supreme Court’s decision was about TAXES. Nothing else. And as far as state and federal governments are concerned, the word marriage is primarily about taxes and finances…a little bit about child custody…and that’s pretty much the limit of it. While, for religious folk, the term “marriage” is inextricably wound up in spirituality and faith. Any Christian objecting to gay marriage will inevitably cite Levitical verses about how much God hates homosexuality, and how he can only sanction and bless a marriage between a woman and man. Yet they don’t seem uncomfortable recognizing a marriage between atheists (who do not define their marriage from a spiritual perspective), or between Hindus or Buddhists, who (according to the Bible) are following false gods. But I DO want to have the same LAWS apply to my 11-year partnership that the newlyweds across the street are governed under. It makes no sense in my brain that a different set of laws would apply to me…than apply to any other American. How is THAT an American concept? Perhaps it’s a Biblical concept, depending on which part of the Bible you emphasize. But we don’t live in the United Church of America. This country is filled with people of all religions and no religions. To treat ANY AMERICAN differently under the law is decidedly un-American. So, to Pat Robertson and everyone else who stringently objects to gay marriage…I’m not asking for YOUR version of the word “marriage.” The god you worship wouldn’t recognize it, anyway. Though the god many other Christians worship certainly would. (Isn’t that strange? They are, in fact, the same god, according to the Bible. Perhaps we are making god in OUR image?) I’m asking for the government to treat me under the exact same laws as you are treated. Because our government is not a church. It treats Muslims and Zoroastrians the same way it does Christians and atheists. So next time you start to get all riled up about issues like these…stop for a moment and ask yourself if this is all really about words. And remember that words have NO power unless you grant them that power yourself. If someone makes a remark to you with hatred behind it…it’s your choice whether to give that person the power to upset you with that word. I seriously doubt that Paula Deen is spewing hatred at anyone. (If she was, I would imagine that person would seek out another job. Cooking jobs are a dime a dozen. And they don’t pay very well ANYWHERE.) My gut tells me that this “whistleblower” is yet another of those many white people who are on the edge of their chairs, waiting for that penultimate moment when they can be supremely, deeply offended to the core…on behalf of someone else…someone who witnessed playful bantering among compatriots and is so set on ending racism forever that they continue to perpetuate it by giving power to words that were never delivered with hate. But let’s just say, to play Devil’s Advocate, that Paula Deen is the most horrid, hate-filled racist in all the American South. For that matter, let’s also blame her for ALL the diabetes and heart disease in this country. (Many people do, which is laughably ridiculous.) Have we lost the ability to forgive when someone apologizes sincerely? When someone desperately wants to change? As a culture, we love to crucify someone and watch with glee as they fall. (Why else would MasterChef be turning into Hell’s Kitchen?) We seem incapable of forgiveness. We seem to think that people remain static their whole lives and never have a change of heart. And we never give them the chance to do so. -Racism, sexism, homophobia, and other types of minority persecution will NEVER END as long as we continue to gather ourselves into groups to support our cause and celebrate our uniqueness. Because we are separating ourselves. When “minorities” of any sort stop pooling with their “own kind” and start integrating themselves as proud humans into neighborhoods, marriages, churches, and workplaces…revealing their humanity to their neighbors and coworkers through budding friendships…that’s when progress begins. -We could all stand to be a little more forgiving. That goes for corporations, too, who are sometimes trigger happy to kill their relationships with people they believe will give them a bad image. 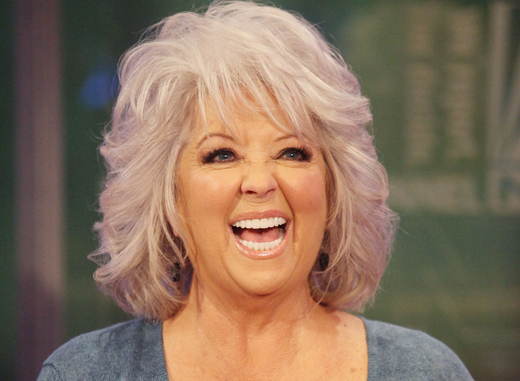 Paula Deen has brought joy into the lives of millions of people for many decades. Let’s not be so quick to throw her out like last week’s leftovers, especially if she offers a heartfelt apology. -Words have no power unless you give that power to them. If something is said with hatred, you don’t have to receive it as such. If something is said that initially triggers offense in you, it may not have been delivered with intended hatred, and you still don’t have to receive it as such. Hatred only has power when you allow it to. Now what words do YOU have to say about all this? Please comment below. We’re down to only 7. And the mystery box on the stage is big enough to house an entire cow or side of beef. And had the commercials not spoiled it, I’d have NO clue that it was a mere human standing inside. I’m conflicted about the spoiling of the mystery box surprise…I’d have been FAR more excited to be wondering what was inside, than to be wondering why on earth the mystery box is so freakin’ big if Paul Deen is hiding inside it. Maybe she’s stretched out on a sofa being fanned by pool boys?!? I know they’ll probably get more viewers by broadcasting Paula’s participation ahead of time…but it really did ruin the surprise. So here we have the legendary Paula Deen to emcee the next Mystery Box challenge. Just like Rachael Ray, Paula tends to elicit a fairly dramatic response among TV viewers…you either love her, or you hate her. 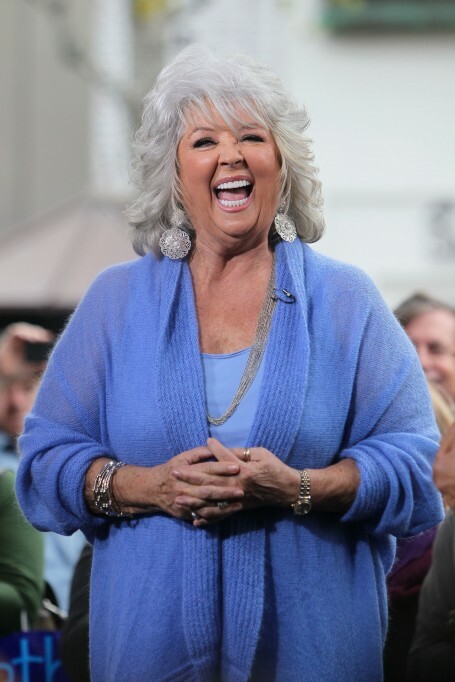 I, for one, love Paula Deen. I think she’s a great TV personality. She’s fun to watch, her recipes are good, and she embodies the small food entrepreneur success story. At age 39 after a messy divorce, she moved to Savannah with only $200 in her pocket and started a sandwich catering company. And look where she is now! She has an empire, and she is loved by so many. She comes under very pointed criticism from folks like Anthony Bourdain for promoting traditional Southern cooking, which includes large concentrations of butter (for which she is known), sugar, and saturated fats. But let us not forget that the great Julia Child championed the butter-drenched, cream-enriched, sugary-sweet French cuisine to the world, and single handedly got people back into the kitchen in this country, after the TV dinner became king in the aftermath of World War II. I don’t hear Bordain condemning Julia! I have ZERO problem with Paula’s style of cooking, provided enough education is included to let people who are otherwise unaware, that you shouldn’t put a stick of butter in EVERY recipe. Just the special ones! “Why Paul Deen?” is what everyone has been asking me. She’s not necessarily known for sophisticated cuisine. Well, the simple answer is: Walmart. That’s an assumption on my part, but Paula does sell a line of cookware at Walmart (some of which is enameled cast iron, and it’s of pretty decent quality for its price! ), and you can’t walk inside the kitchen section of Walmart without seeing Paula’s bright smile all around you. So it was a natural assumption to think that her appearance is somehow connected to the big Walmart sponsorship. But I could be wrong. At any rate, when the mystery box rises and Paula appears from beneath it, you can tell, even if YOU don’t like Paula Deen, that the contestants are peeing their pants with excitement. I would have been, too. Bawling my eyes out. Paula is a legend to me, and the ability to be able to cook for her would have been extraordinary. My style of cooking is closer to hers than to ANY other celebrity chef I’ve cooked for, including Rachael Ray and Bobby Flay. Paula has hand picked the mystery box ingredients for this challenge, and let me tell you…while I normally hate Mystery Box challenges, this one would have been CAKE for me: a whole chicken, green tomatoes, collard greens, okra, grits, blackberries, hot sauce, pepper jelly, bacon, cream cheese, red potatoes, onion, garlic, brown sugar, and, of course…butter. And who knows what else? I have a suspicion that there is a mystery box pantry this year where the contestants have access to staples like flour, eggs, etc. because Paula said she’d love to see fried chicken, which can’t be done without flour, and there was no flour under the box. Also, Becky makes biscuits, which we all know can’t be done without flour. So I’d love to know the list of ingredients in the staples kitchen! Paula has another surprise…she tells the contestants to open their cabinets and inside is a photo of their family, and a letter. I cannot tell you how much more powerful this moment was for the contestants than what you saw on the screen. At this point they’ve been away from home for over a month without being able to talk to their family. The stress is unimaginable. The sense of loneliness is overwhelming. I remember getting a letter from my partner, with photos of my friends and family and Oliver in it, the morning before a challenge in late February. And I just completely lost it for 2 hours, bawling my eyes out. I was SO homesick. And when we, as an audience, get to hear some things in the letters and see the contestants reactions…this is genuine and heartfelt and I WANT MORE OF IT. Christine’s husband John, who is such an amazing person and actually helped me finish this website, mentioned in his letter that Christine has already accomplished “more in life than most people with no obstacles.” We catch a glimpse of Frank’s daughter and immediately we re-imagine Frank as a father. (I wish that had happened last year with Christian.) Becky and Felix both have heartwarming letters from their parents. Felix’s parents live in Puna, the district on the Big Island of Hawaii where I want to start my farm, and in their letter we discover that she hasn’t seen them in over a year. Monti’s face as she embraces the photo of her son, Danger, is priceless. I wouldn’t have minded if half this episode was taken up with the contestants reading their letters from home and talking about their families. Time starts, and this would be my menu…fried chicken (leg and thigh), buttermilk biscuits with crispy chicken skin cracklins, collard greens with bacon, fried okra and fried green tomatoes (if there’s no cornmeal in the staples pantry, I’d use grits for the breading), and a little blackberry cobbler with cream cheese in the crust. And yes, that can all be done in an hour! Becky, with her oven-roasted chicken and biscuits, fried green tomatoes, and pan gravy, with a cream cheese and pepper jelly sauce. Frank, who departed from the Southern palate with his chicken roulade. A roulade is just a method of presentation where the ingredients are layered and then rolled. His roulade has peppers and onions, bacon, chicken, and chicken skin on the outside, and MAN does it look GOOOOD. He made a chutney with the green tomato and red pepper, and it was served with spicy potato fries. His spicy fries get the best of Paula and she coughs a little, but declares that she loves it. And David Martinez, who has a truly stunning dish. Roasted red pepper grits…and I’m not a big fan of grits, but these sound superb…pan roasted chicken breast with some sort of glaze, and crispy fried onion strings. Paula jumps on Gordon for saying that grits can normally be “bland and boring,” and it’s funny to see how fast Paula shut him up! I don’t normally imagine Gordon blushing at being chastised by anyone, but Paula certainly got his goat!!! And they award the top dish to Frank, for taking basic Southern-style ingredients and churning out a sophisticated, New American style dish. I didn’t taste, but the dish *I* wanted to eat the most was actually David’s. Paula kisses the contestants goodbye, and Frank heads to the pantry to learn his advantage, and thus begins the most insane elimination challenge I’ve EVER seen on MasterChef: the sushi tag-team. Frank gets to pair up the remaining 6 contestants in teams to prepare sushi. The team never works together simultaneously…they work in 5 minute shifts. And they have to replicate a large plate of food, including tempura battered vegetables; ahi, yellowtail, salmon, and shrimp nigiri sushi (where the fish fillet sits on top of a pillow of rice); and a California roll, which is an inside-out sushi roll where the veggies and fish are in the center, wrapped in nori (seaweed paper), with the rice on the OUTSIDE, then sprinkled with tobika caviar (eggs of the flying fish, which are bright orange). This is probably the ONLY challenge I’d have actually wanted to sit out. Sushi is an incredibly complex cuisine. Sushi chefs train for literally DECADES before they are permitted to work unsupervised. While there’s very little cookery involved, the knife work for the fish slicing, and the rolling are not things you can just improvise. And to complicate matters, Frank was clever in his assignments to choose teams that would have the highest risk for failure. Becky and David are together, Felix and Monti, and Christine and Stacey. Luckily, Felix and Christine both have practical sushi experience. Becky and Stacey, living in southern California, probably eat a fair amount of sushi. And David says that he is confident as well. Monti confesses that she’s clueless. And this bizarre dynamic of the tag-team procedure is definitely going to throw people for a loop. What follows is the most nail-biting challenge I’ve seen in MasterChef. Arguments, desperation…and I can’t even imagine how Christine must feel not being able to SEE what Stacey is doing. If Stacey says, “Am I doing this right?” Christine can’t answer. They are definitely at the disadvantage in this challenge. At the end, Monti and Felix have a complete plate that’s actually really impressive. Monti says, “Felix finished 14 pieces of sushi in 4 minutes and 45 seconds. That’s about as impressed as I’ve ever been with anybody.” The other teams aren’t quite so lucky. David and Becky have a plate that appears to be mostly complete, but Gordon picks through everything and finds wasabi under some fish, not under others, messy cuts, no dipping sauce for the tempura, and David takes blame for much of it. Christine and Stacey didn’t complete their California roll, which is a glaring omission, and Stacey is sick about it. The cut on their nigiri is definitely superior to David and Becky, but their shrimp is raw. Gordon declares it the worst performance they’ve both had in MasterChef. So we know that Stacey and Christine are on the chopping block. Not a fun moment. I love both of these girls, and I know how hard it is for them to be sitting there, facing elimination, feeling like if the other gets eliminated, they’re both at fault. Since Christine was responsible for the biggest items to get on the plate, the nigiri, Stacey is eliminated. And Christine is deeply upset about it. Even Christine’s helper is weeping. Stacey was so loved by the contestants. We are given tidbits about the contestants’ lives in the first episode of signature dishes, but we tend to forget these as the contest moves on and we become more familiar with their personalities. Do you remember that Stacey, 2 years ago, was drinking a liter of vodka a day? She went through rehab and has been stone cold sober since May of 2010. Do you remember that the judges sent her out without an apron, but Joe reconsidered and staked his reputation on her? And she lasted to number 7. Stacey is a fighter, and a talented one at that. I shed some tears watching her leave. But, like always, MasterChef isn’t the end for Stacey. She’s being considered for an executive chef position at a restaurant on the Hawaiian island of Kauai. So maybe, in a few short years, we’ll be neighbors! I can’t wait to meet Stacey in August on my LA trip, because I know that she’s truly one of the most special and amazing souls in this year’s MasterChef lineup. You blew me away Stacey! Follow Stacey on Twitter and Facebook if you’d like to keep track of her journey! And PLEASE comment below!